I keep hearing that Twitter will soon have premium (paid) accounts for businesses. That will be good. Bite sized chunks, clearly articulated will dramatically improve marketing communications. I kept thinking, what would I, as a small entrepreneur need from Twitter. Here are a few. 1. A more flexible layout of my twitter page (Right now there is some innovative backgrounds, but a customizable page would be great). 2. A set of tags to define my business as a part of my profile. Search engines can use these tags to do better searches. 3. A widget framework (this is the geek in me speaking) that allows people to build widgets and put them on the home page. 4. A better search. This should not be too difficult to do since Twitter has a lot more context than generic content on the web. 5. A tagcloud of tweets, retweet, replies in the user home page would be of great help.This could be a widget. 6. Tweets as commands. For example, @wefollow #tag #tag #tag is a kind of command. This feature deserves a full blog post. 7. Twitter as a distributed data collector. People can send in all kinds of data (to all kinds of apps) using simple text. 8. Twitter Usage Patterns: will help people understand how to use the product better for business. 9. I would love to have 255 characters. While I manage to live with 140, I need to constantly edit when I retweet. 10. I would love to see some formatting improvements in retweets. I may retweet with a comment and that should show up in a different color/format than the quoted text. 11. I would also love to see some kind of permalink pointing to the original post in the case of replies. Makes it easy to follow conversation. 12. Raw Twitter Data as open linked data may let lots of new innovative applications bloom. This is my first installment of wishes. There will be more but these are the most essential ones. One of the cool things about being on Twitter is the rapid rate at which you discover new resources on the web. 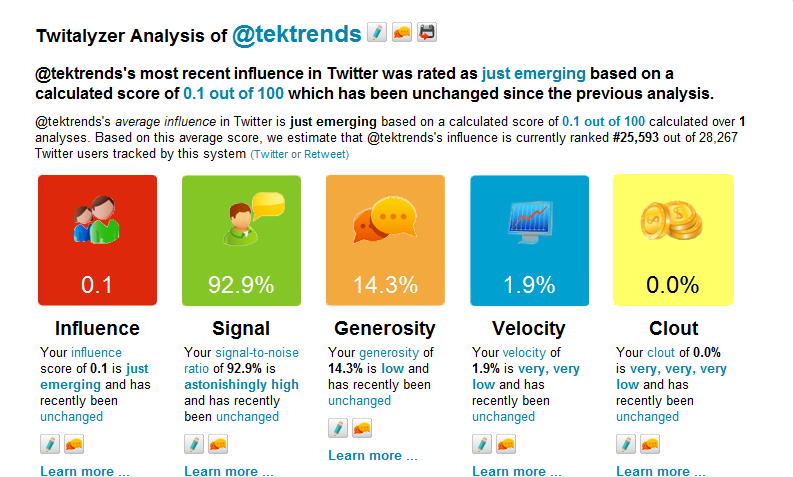 Just a few minutes ago, I saw “6 Unique Twitter Visualizations” http://bit.ly/Fz05O from @RSS_Buzztracker. The first thing you do, of course, is to make it a favorite and retweet it so that your friends can enjoy it too. TwitterThoughts creates charts based on Twitter tweets in combination with lots of APIs: From a sample of 600 tweets/minute served by the Twitter Api that we send to Yahoo Pipes where it extracts all phrases from the tweet text and the latitude/longitude with use of Yahoo YQL. This Yahoo Pipe outputs serialized PHP back to our local update script that grabs every tweet and phrase and puts it in our MySql database. Daily overviews for fast rendering of the chart data are generated with a daily CRON update. Finally Google Visualization API generates an interactive flash chart based on our JSON data feed. I think as we get more useful data, especially trending data, we will start finding more innovative visualizations. It is rare that in three days time you come across four references to similar technologies. That is what happened to me a couple of days ago. There was a reference to Hadoop on Twitter. I almost forgot about Hadoop, the open source equivalent of Map/Reduce. I was watching a rather unusual Google Tech Talk the other day. It was unusual, because a person from Microsoft Research was talking about Dryad, their distributed execution engine, at Google. One of the participants asked a question whether the speaker can compare Dryad to IBM’s Stream Processing Core. So I had to look it up. Following a few links from the IBM article, I found SPADE, a declarative language for handling streaming data. I have always been fascinated by domain specific languages to solve special problems, especially with data. You learn a lot by just understanding the high level concepts. So here they are. A set of related technologies with some overlap. 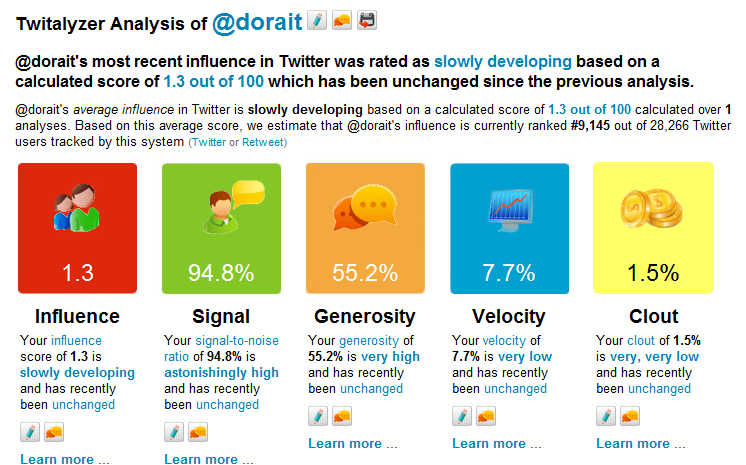 I was reading this cool article about 8 Excellent Tools for Extracting Insights from Twitter Streams. 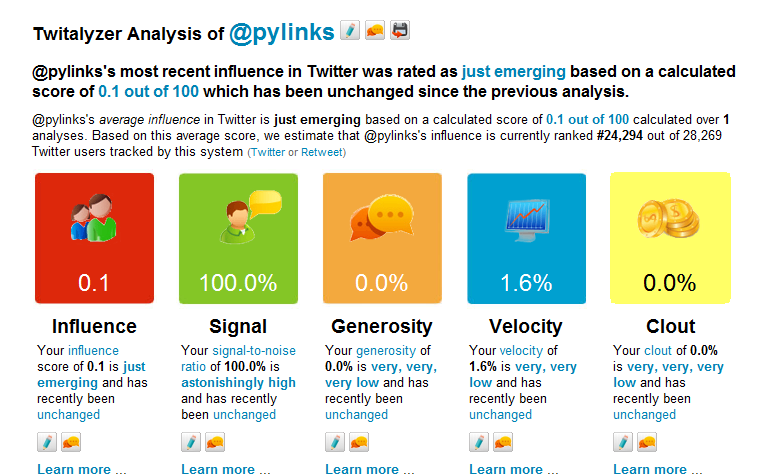 I started first with Twitalyzer and tried it with three of my Twitter accounts @dorait @tektrends and @pylinks. @dorait has been around for a while, but tektrends and pylinks were started more recently. I don’t think I have done this much of talking, in a while. It was great and I loved every bit of it. I gave ten Talks in about twelve days (weekends included) in three different states. It is kind of cool. In the end, I learned a lot and had many great interactions. I think it is a great way to meet people and start conversations. Some of these conversations continue – some on Twitter and others in email. Surprising to see the level of interest in entrepreneurship among students. Wish we can figure out an efficient way to help them do simple micro-startups. An unassuming kid (almost a kid) is working on a framework for modeling brain. Whoa! Had a nice lunch talk and plan to follow up. After every talk, there is small cluster of people who come up and continue the conversation. This is the best part of giving a talk. Interaction in smaller crowds always seems to be better than larger crowds. Interaction is better when the crowd is a bit homogeneous (barcampers, CS students, management students). If you mix them up, it is more difficult to find a common theme. I always prefer the audience to talk way more than I do. But that does not happen most of the time. They seem to spend a lot of time absorbing the information and lot less time challenging. I finally found some really, really cool people – a girl with interest in game development, a boy with an interest AI and machine learning, a small club of semantic web enthusiasts, a very vocal group of Tweeters. Give the same talk to two different audience and surprisingly, you get entirely different discussions. The best people to talk to (at least for me) are geeks. Eternally curious, amazingly insightful and entertainingly opinionated. Better then geeks are the small subset of geeks who are aspiring entrepreneurs. I can spend hours with them and not even notice the time passing. I know what I am going to do for the rest of my life. Just find lots of opportunities to have conversations. They are way more fun than anything else I have done in my life so far. I just need to constantly reinvent myself to stay entertaining, informative and interesting.